Bell Curves collaborates with organizations to provide a broad spectrum of support to help members achieve educational and career success. Bell Curves works with organizations and schools to evaluate and identify areas in which the skills and talents of our team and the resources at our disposal will most efficiently support your organization's existing programs and goals. 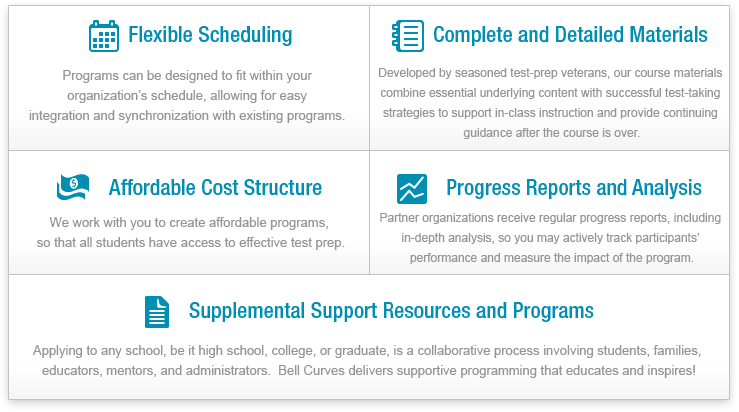 Our robust suite of programs and services go beyond typical test preparation. We provide personalized attention, comprehensive materials, and oustanding teaching quality at an affordable price. Offer Your Members Discounted Rates! "As a result of the Bell Curves college preparation program, Rise to College scholars have shown marked improved in their performance on the SAT college entrance exam. The Bell Curves teaching staff went beyond what was required of them to best serve their students." "Bell Curves has been a supporter of GTT since its inception. Their dedicated team has and will continue to provide excellent service to all of the students participating in GTT programming. Their customer service is unparalleled and we are honored to count Bell Curves as a partner organization." "As a result of the Bell Curves Saturday Academy program, students have improved on their statewide math and English language arts assessments."